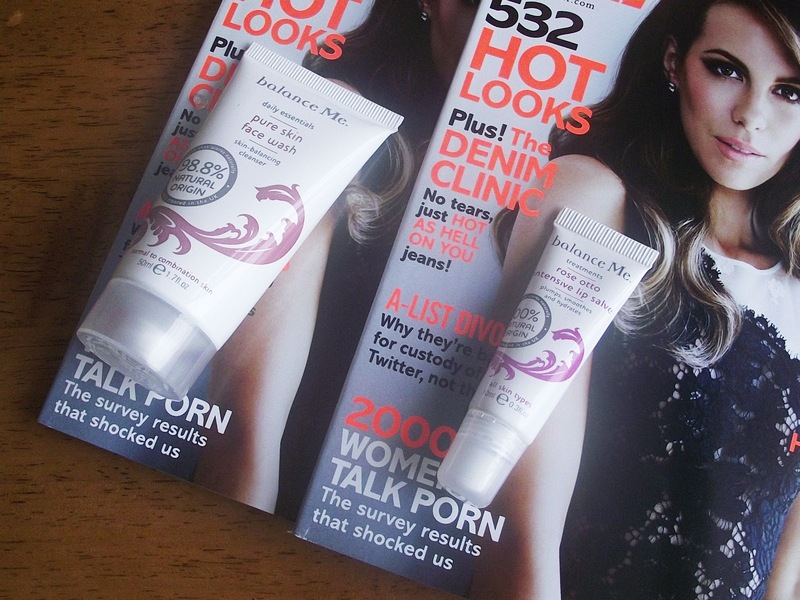 Beauty In The Mirror: The Curse of Magazines and their Freebies! The Curse of Magazines and their Freebies! I'm hoping I'm not the only one to be succumbed by the amount of magazines and their alluring freebies? Well... I think I need to draw a line, I've spent nearly £10 on magazines this month already! I don't intend on spending another penny this month on any more but let's hope these magazines give our purses a rest next month. After last months Glamour I did pick up another sample of The Porefessional, but sadly never got the chance to find 'that Gal'. Which was a tad annoying, however if truth be told the sample I did want was The Porefessional, so I have two of them which is great. This week, magazines have now published their August issues and boy have I seen an array of nice freebies to be had! I'm already subscribed to Glamour and knew from their July issue about the balance Me samples. Straight away I knew I wanted to try the Rose Otto Lip salve, so when my copy landed on my door mat it took all of a few seconds to rip open the packet to reveal the lip salve. Phew! Just when I thought that was enough to fill me, I only went and heard that Red Magazine was giving away samples of REN with their August issue! Damn you magazines and your tantalising freebies. So off I went in search of Red magazine. Thankfully I picked up the last copy in my local Morrison's, since then I have seen a few more copies so I don't think you'll struggle to find it. I'm ashamed to say that wasn't the end of my frantic magazine purchasing, after trying the balance Me Rose Otto Lip Slave I knew I needed a back up, so off I went in search of Glamour. I visited my local Sainsbury's only to find the shelves empty and then my local Tesco and again empty shelves, then I thought OH NO! This isn't going to get like last month where you couldn't get the magazines anywhere. Thankfully my little small co-op had a few copies, only one lip salve which was fine. But the face wash was saying 'pick me' so it ended up in the basket as well, amongst my peanut butter Kit-Kat. Then I heard my subconscious say MOVE AWAY from the magazines! NOW! 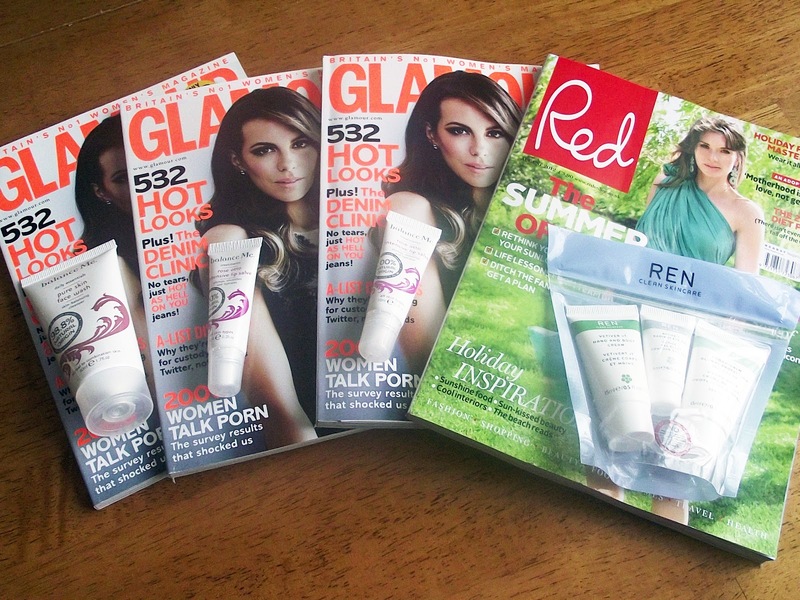 Have you been hit by the curse of Magazines and their freebies?? I got the Porefessional which I was very pleased about and nearly bought Glamour for the Rose Otto salve...but I haven't actually read the previous Glamour yet :S I also bought InStyle which I normally buy anyway and got a Body Shop Mascara which I have reviewed :) Loving the freebies! I managed to get my hands on Porefessional and nearly succumbed to buying Glamour with the B|alance Me freebies but havent actually read the previous one yet! Also got the Body Shop mascara from Instyle which I have reviewed :) Loving the freebies - may have to try and find Red next! 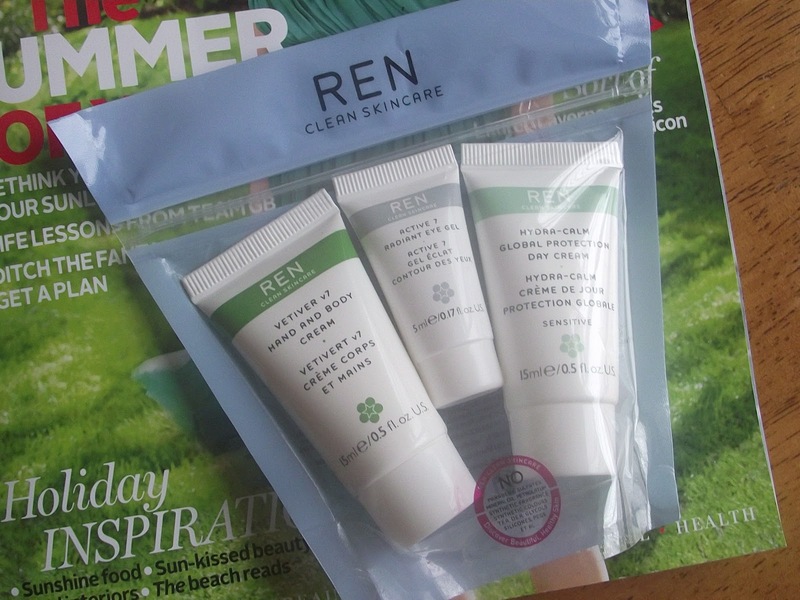 I looked at the Glamour but they only had the facewash left..I'm going to look out for the lipsalve though. I have a real thing for hand cream..always looking for a cream that helps my horribly dry hands but smells nice too..never had much luck but I decided to get this month's Harpers Bazaar which comes with the Neom hand cream...I got the Violet, Cederwood and Chamomile scent and my word it's heavenly! Grab it while you can!